Polls conducted since our update last evening suggest some tightening toward John McCain, but he sits well behind both nationwide and in many key battleground states and remains a long-shot to win the election. The good news for McCain? SurveyUSA has become the latest pollster to show the race tightening in Pennslyvania, now giving Barack Obama a 7-point lead after he'd been in the mid-double digits at various points in October. The Muhlenberg/Morning Call tracker has also continued to tighten, also settling on that 7-point number. SurveyUSA also has Virginia tightening a bit to 4 points. And McCain gained incrementally in the Research 2000, Gallup, and Diageo/Hotline trackers, although this comes after a couple of days when Obama had been moving up. 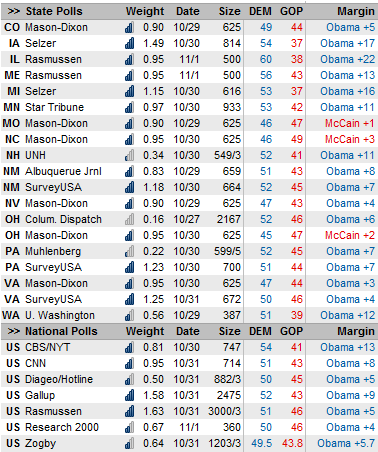 (Rasmussen held steady, whereas Obama ticked up in Zogby). Overall, our model shows McCain closing Obama's gap in the national popular vote to about 5.4 points. His win percentage has increased to 6.3 percent, from 3.8 percent last night. Firstly, I have the model programmed to be EXTREMELY aggressive this time of year. There have been relatively few 'fresh' polls conducted within the past 24-48 hours -- most of these state polls were in the field late last week. As we get more data in today and tonight, the model could very well decide that the race is not tightening at all. Moreover, polls conducted on a weekend -- particularly on a quasi- holiday weekend -- is generally unreliable. John McCain polling within 2 points in 2 or more non-partisan polls (sorry, Strategic Vision) in at least 2 out of the 3 following states: Colorado, Virginia, Pennsylvania.